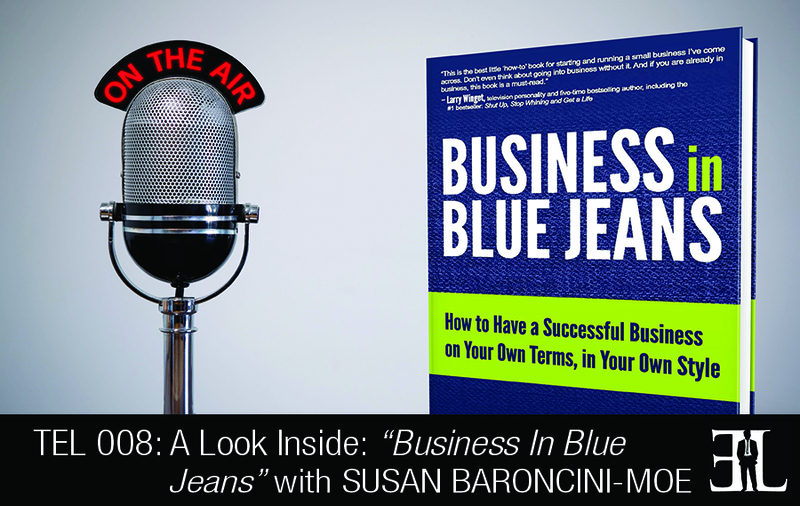 Business in Blue Jeans is designed to be as close to the experience of working with Susan Baroncini-Moe one on one. When you read the book it is very much like the way she works with her clients. She starts with letting you know that you aren’t alone, giving you examples of things you need to know. The other thing is this book is based on fundamentals and we all need those fundamentals because if your business isn’t growing its most liking you need to find out what fundamentals you’re missing. It is written for people who are starting a business and people who are in growth. There are a lot of books out there regarding this topic but the way I say it is a lot different from others. I don’t start with saying let’s start your own business; I start with asking you what you really want out of life. We don’t want to just start a business that you hate; we want to create a business that makes whatever you want out of life possible. I am all about creating a business that makes since for each individual person. The other thing is this book is based on fundamentals and we all need those fundamentals because if your business isn’t growing its most liking you need to find out what fundamentals you’re missing. It is written for people who are starting a business and people who are in growth. There are homework assignments throughout the book for both audiences. The most important concept to me is the chapter on brain junk. The reason I believe it’s the most important is it’s the starting point. If you don’t address your brain junk every step of the way is going to be impacted by your brain junk. The book is designed to be as close to the experience of working with me one on one. When you read the book it is very much like the way I work with my clients. So I start with letting you know that you aren’t alone, giving you examples of things you need to know and when you read this book I want you to feel like I’m right there by your side. It’s written to be approachable and friendly. I talk a lot about how there is no get rich quick in business and it’s really not about that. There are certainly ways of making the process easier and shorter but it’s really not about going super-fast and getting rich quick. The chapter I start with is titled Brain Junk and I start there because at the end of the day, if you don’t work on your brain junk, you will sabotage every piece of success that you’re able to create. We all have these ideas about ourselves, our business, and our money and we need to make sure those ideas are moving us into a positive direction. If we don’t deal with those ideas, they are going to hold us completely back. I also cover how to take care of yourself because you’re your own best resource and if the captain goes down, the ship goes down with it. We talk a lot about stress, sleep, time management, relationships and things like that. I think those are the fundamental places to start because they are really building a solid foundation. I go more into what I call The Fire which is really about what you love doing and what your business makes possible. When you are deciding on a new business you need to know what you love doing and what you’re good at doing. It’s at the cross section of where those two things meet that you’re going to have the most likelihood for success. Once you figure out what it’s going to take and you know your business is centered in the right place then we talk about what I call The Packaging. We talk about things like target market, mission statements and competition. We also talk about how to develop product and service offerings, creating a business model and how to deliver products and services. And then I have a chapter called Leaning into your Marketing which is basically a philosophy of going a step beyond engagement marketing. It’s about how to create a marketing brand, what are the big mistakes in branding that a lot of big companies are making and leaning into your marketing. And I also include a piece on marketing with conscience because I think it’s important that we make the world a better place. The last chapter of the book is about The Village and this is about creating a support structure for your business. I talk about the real intense and the perfection into masterminds and why it’s such a great concept. Then I talk about networking and getting your administrative staff together to help you manage your business. It’s also important to have a good advisory staff that can really help you and know the answers to the questions that you have. The book is design to give the reader really good start and/or a big burst in their growth. I am the CEO of a company called Business in Blue Jeans. We are a digital marketing and consulting firm. We do full scale marketing all the way down from teaching/training you, to doing it for you. I also do a lot of business coaching and work with a large variety of all kinds of clients for the past 16 years or so. I have always wanted to write a book but wasn’t sure what that would be. After working with a lot of people, I found myself saying the same things, and realized a book was a good resource for those that couldn’t afford to hire a coach. I thought I should really put this in book format so people can get a taste of my philosophy of doing business and how I do it differently. What other resources did you use to help you get your business running? If you could ask one piece of advice from Susan, what would you ask her?